5:30 pm Update: This afternoon's model runs confirm the earlier trend away from late Sunday/early Monday precipitation, although it can't be completely ruled out. The computer models have continued to disagree overnight over the prospects of snow Sunday night/Monday morning, but each of the major U.S. models has remained consistent with its own previous snow vs. no-snow forecasts. The lack of consistency between models at the 36-hour range weakens the pro-precipitation case, however, so the chances of a wintry event are diminishing. The main effect on the Inauguration of such an event would be to reduce temperatures on Tuesday, increasing the likelihood that readings would remain below freezing. As noted here this morning, one of the major U.S. weather models (known as GFS) has been suggesting the development of a storm system over the Southeast which could bring some snow to the Washington area late Sunday and into Monday. As of the afternoon runs based on 1 pm data, this is not being confirmed by the shorter-range, higher-resolution model (NAM) or the earlier European medium-range model (ECMWF). The afternoon GFS model output, which is still being generated, is generally consistent with that model's earlier results, however. WHAT HAPPENS BEYOND SATURDAY AFTERNOON IS MUCH MORE INTERESTING AND CHALLENGING. 12Z GFS DEVELOPS LOW PRESSURE ACROSS THE SOUTHEAST STATES ON SUNDAY AND TREKS IT NORTHEAST ALONG THE MID ATLANTIC COAST THROUGH MONDAY MORNING AND UP THE NORTHEAST COAST MONDAY AFTERNOON. THIS SOLUTION WOULD BRING INCREASED CHANCES OF SNOW ACROSS THE CWA ESPECIALLY AREAS EAST OF THE BLUE RIDGE SUNDAY NIGHT INTO MONDAY MORNING. THERE/S SOME SUPPORT FROM THE 09Z SREF AND GFS ENSEMBLES IN THIS SOLUTION. HOWEVER...THE 00Z AND 12Z ECMWF DOES NOT SUPPORT THIS SOLUTION AND HAS LITTLE OR NO PRECIPITATION CHANCES SUNDAY NIGHT INTO MONDAY MORNING EXCEPT FOR UPSLOPE AREAS OF THE HIGHLANDS. THE 12Z NAM IS IN THE SAME CAMP AS THE ECMWF. THE DIVERGING SOLUTIONS ADD TO THE UNCERTAINTY OF THIS FORECAST. AFTER MUCH CONSIDERATION AND COLLABORATION...WE HAVE DECIDED TO INCREASE CHANCES OF SNOW ACROSS THE CWA IN LIGHT OF THE GFS/GFS ENSEMBLE/SREF FORECASTS. IF THEY ARE CORRECT...SOME SNOW ACCUMULATION IS LIKELY. ON THE FLIP SIDE...IF THE ECMWF/NAM SOLUTIONS WIN OUT...THEN LITTLE OR NO SNOW MAY OCCUR. WE WILL NEED TO KEEP A CLOSE WATCH ON THIS SYSTEM AND ADJUST DETAILS AS MODEL GUIDANCE BECOMES IN BETTER AGREEMENT. Meanwhile, bitterly cold air is entrenched in the area. After a morning low of 11° at 8:23 am, the high has made it up to only 18°. This makes it the coldest daily high since it was 17° on Feb. 4, 1996. Tonight promises to be the coldest of the current spell, with lows around 8°. After days of showing relatively dry conditions through Inauguration Day, the last couple of model forecasts have been hinting at a storm developing off the Southeast coast on Monday and becoming a classic nor'easter off New England by Monday night. The most recent model run, made from this morning's 7 am observations, is just now generating its output, and it shows a particularly strong development. Since this is within the 72-hour range for which model forecasts have some positive skill, the situation bears further watching. As shown in the current model output, the heaviest snow (green shading) would be to the south and east of Washington, but several inches of snow in the immediate area would still be possible. The strong northwesterly flow behind such a storm development would also bring much colder temperatures to the Washington area on Tuesday. Stay tuned for further developments (and remember where you saw it first :)). Inauguration Weather Forecast Update: Numb or Number? Following on the heels of a very light dusting of snow around dawn this morning (all 3 major airports reported a trace), northwesterly winds gusting as high as 38 mph are bringing an Arctic chill to the Nation's Capital area. Temperatures which have remained in the 20s all day are expected to drop to the mid teens tonight. Below-average temperatures will persist through the weekend and into Inauguration Week, but the coldest readings are likely Friday into early Saturday, with a high in the low 20s and a low Friday night in the upper single digits. More clouds than sun. Highs in the mid 30s and lows in the upper 20s. January 20 is now moving out of the extended forecast range, but the latest 6-10 day forecast, for Jan. 20-24, continues to call for significantly colder than average temperatures. The probability of below-average readings in the Washington area is over 50%. Relatively dry conditions are also still likely, with a 40%+ chance of below-average precipitation. Looking at the shorter term, Washington is moving into one of its most intense cold waves in several winters. The National Weather Service notes that Friday's expected high is near the 21° recorded on Jan. 10, 2004. The record low maximum for Jan. 16, however, was 15° in 1893. Today's high was 36° at midnight, but daytime temperatures have remained below freezing. Some light snow was reported on radar, but little, if any, reached the ground. A low pressure area moving eastward from the Ohio Valley will help usher in some even colder Arctic air for the next several days. High temperatures on Thursday will again have a hard time reaching the freezing mark, and highs on Friday will be in the low 20s. Temperatures are likely to remain below freezing through much of the weekend, but with some moderation late Sunday and Monday. The latest extended outlook from the Climate Prediction Center, for the 6-10 day period Jan. 19-23, continues to call for cold temperatures in the Washington, DC area. Probabilities are 50%+ for below-average temperatures through nearly the entire East Coast. Precipitation chances are 33-40% for below-average amounts. Cold Arctic air making its way toward the East Coast on Wednesday will persist at least through the weekend before Inauguration Day. After highs in the low 30s tomorrow, temperatures are likely to remain below freezing through Saturday, with only a little moderation into the early part of next week. This means that highs on Inauguration Day are likely to be in the low to mid 30s. Current indications are that the chance of precipitation will be low, less than 30%, on January 20. Once again, as they have ever since January 20 moved within the target date window, the latest 6-10 and 8-14 day extended range forecasts are indicating cooler and drier than average weather for the period leading up to and through the Inauguration. The 5-day interval centered on Inauguration Day (Jan. 18-22) is expected to be colder than average with at least a 60% probability. Conditions are likely to moderate toward the end of the period, with chances of cooler than average temperatures lowered to 40% or more for the 7 days of Jan. 20-26. For precipitation, the chances of drier than average conditions are about 50% for Jan. 18-22 and 40% or higher for Jan. 20-26. The specific daily model forecast (read the caveats!) 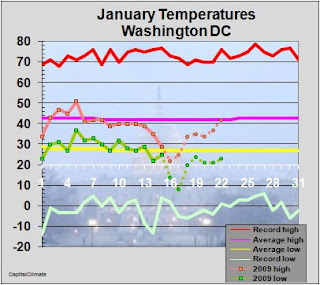 continues to imply a moderating temperature trend beginning around Jan. 20. With Inauguration Day 9 days away, it's still too early for a specific daily forecast, but a pattern is emerging for a cold pre-Inaugural week. Some moderation is possible by January 20, but the exact timing is not yet definite. Today's extended range forecasts continue to show below-average temperatures for the Washington, DC region in both the 6-10 and 8-14 day periods. For Jan. 17-21, temperatures are forecast to be below average along the entire East Coast with a 40%+ probability. Likewise, Jan. 19-25 is also projected colder than average, with the chances for the Mid Atlantic area closer to 50% than 40%. Precipitation probabilities continue to favor below-average amounts: 33-40% for Jan. 17-21 and 50%+ for Jan. 19-25. Looking at the day-to-day pattern evolution (read the caveats! ), a series of Arctic airmass outbreaks across the eastern U.S. is forecast through the upcoming pre-Inauguration week and into next weekend. As of now, however, there is at least the suggestion of some moderation by the day of the event.